Lenses are a fascinating subject. Edward Kmett’s lens library is an indispensable tool in every Haskell programmer’s toolbox. I set out to write this blog post with the goal of describing some new insights into their categorical interpretation, but then I started reviewing all the different formulations of lenses and their relations to each other. So this post turned into a little summary of the theoretical underpinning of lenses. If you’re already familiar with lenses, you may skip directly to the last section, which describes some new results. Given an object of type s, the first function produces the value of the object’s sub-component of type a — which is the focus of the particular lens. The second function takes the object together with a new value for the sub-component, and produces a modified object. The difference is that the type of x' can now be different from the type of x. The first component of the pair is of type a before the update, and of type b (the same as that of x') after it. This way we can turn a pair of, say, (Int, Bool) to a pair of (String, Bool). We can always go back to the monomorphic version of the lens by choosing b equal to a and t equal to s.
So this is what I would call a “classical” lens. It’s formulated in easy to understand programming terms. Think of this as factoring out the “this” pointer in OO and returning the interface. Of course, the difference is that, in functional programming, the setter does not mutate the original — it returns a new version of the object instead. Substitute Store a for f and you see that a lens is nothing but a coalgebra for this functor. This is not saying much — we have just given a mathematical name to a programming construct, no big deal. 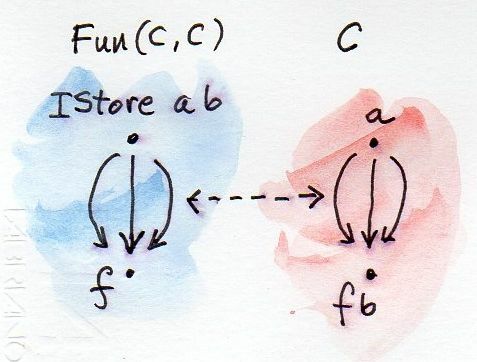 Except that Store a is more than a functor — it’s also a comonad. What’s a comonad? It’s a monad with the arrows reversed. You know that you can define a monad in Haskell using return and join. Reverse the arrows on those two, and you get extract and duplicate, the two functions that define a comonad. Here, w is a type constructor that is also a functor. A lens is a special case of this coalgebra where w is Store a. If these two conditions are satisfied, we call coalg a comonad coalgebra. These two conditions when applied to the Store a comonad are equivalent to our earlier lens laws. and the comonad with its indexed counterpart. The indexed store is also called Context in the lens parlance, and an indexed comonad is also called a parametrized comonad. Notice that iextract is “diagonal” in the index types, whereas the double application of w shares one index, j, between the two applications. This plays very well with the unit and multiplication interpretation of a monad — here it looks just like matrix multiplication (although we are dealing with a comonad rather than a monad). It’s easy to see that the instantiation of the indexed comonad for IStore works the same way as the instantiation of the comonad for Store. The types just work out that way. 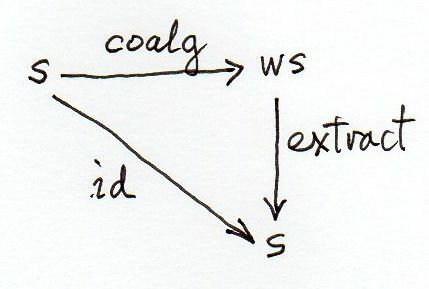 It follows that, for the diagonal components of ICoalg w s t, t must be equal to s. The diagonal part of ICoalg w s t is therefore a family of regular coalgebras. is equivalent to the other two lens laws. Despite being theoretically attractive, standard lenses were awkward to use and, in particular, to compose. The breakthrough came when Twan van Laarhoven realized that there is a higher-order representation for them that has very nice compositional properties. Composing lenses to focus on sub-objects of sub-objects turned into simple function composition. So a lens is a polymorphic higher order function with a twist. The twist is that it’s polymorphic with respect to a functor rather than a type. You can think of it this way: the caller provides a function to modify a particular field of s, turning it from type a to f b. What the caller gets back is a function that transforms the whole of s to f t. The idea is that the lens knows how to reconstruct the object, while putting it under a functor f — if you tell it how to modify a field, also under this functor. Here, s is (a, c) and t is (b, c). Here’s how you can read this definition: For a given s, if you give me a function from a to f b, I will produce a value of type f t. And I don’t care what functor you use! What does it mean not to care about the functor? 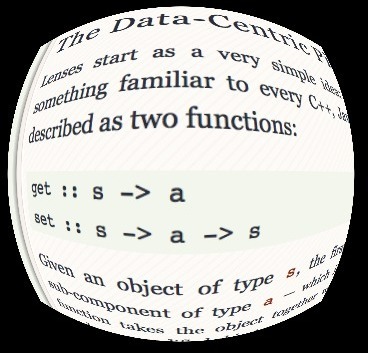 It means that the lens must be parametrically polymorphic in f. It can’t do case analysis on a functor. It must be implemented using the same formula for f being the list functor, or the Maybe functor, or the Const functor, etc. There’s only one thing all these functors have in common, and that’s the fmap function; so that’s what we are allowed to use in the implementation of the lens. 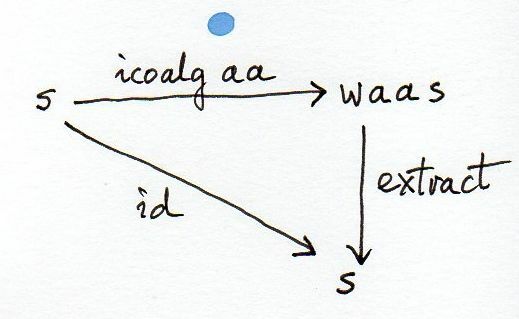 In fact, with a clever choice of functors we can recover both get and set from the van Laarhoven representation. First we select our functor to be Const a. Note that the parameter a is not the one over which the functor is defined. Const a takes a second parameter b over which it is functorial. And, even though it takes b as a type parameter, it doesn’t use it at all. Instead, like a magician, it palms an a, and then reveals it at the end of the trick. The beauty of the van Laarhoven representation is that it composes lenses using simple function composition. A lens takes a function and returns a function. This function can, in turn, be passed as the argument to another lens, and so on. There’s an interesting twist to this kind of composition — the function composition operator in Haskell is the dot, just like the field accessor in OO languages like Java or C++; and the composition follows the same order as the composition of accessors in those languages. This was first observed by Conal Elliott in the context of semantic editor combinators. We get a lens that focuses on the a field of the object s that is the sub-object of the big object u. It works just like in Java, where you apply a dot to the result of a getter or a setter, to dig deeper into a subobject. Not only do lenses compose using regular function composition, but we can also use the identity function as the identity lens. So lenses form a category. It’s time to have a serious look at category theory. Warning: Heavy math ahead! I used parametricity arguments to justify the choice of the van Laarhoven representation for the lens. The lens function is supposed to have the same form for all functors f. Parametricity arguments have an operational feel to them, which is okay, but I feel like a solid categorical justification is more valuable than any symbol-shuffling argument. So I worked on it, and eventually came up with a derivation of the van Laarhoven representation using the Yoneda lemma. Apparently Russell O’Connor and Mauro Jaskelioff had similar feelings because they came up with the same result independently. We used the same approach, going through the Store functor and applying the Yoneda lemma twice, once in the functor category, and once in the Set category (see the Bibliography). I would like to present the same result in a more general setting of the Yoneda embedding. It’s a direct consequence of the Yoneda lemma, and it states that any category can be embedded (fully and faithfully) in the category of functors from that category to Set. Here’s how it works: Let’s fix some object a in some category C. For any object x in that category there is a hom-set C(a, x) of morphisms from a to x. 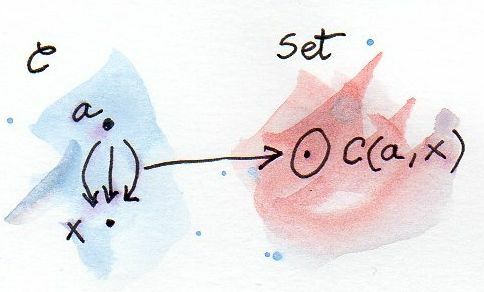 A hom-set is a set — an object in the category Set of sets. So we have defined a mapping from C to Set that takes an x and maps it to the set C(a, x). This mapping is called C(a, _), with the underscore serving as a placeholder for the argument. It’s easy to convince yourself that this mapping is in fact a functor from C to Set. Indeed, take any morphism f from x to y. We want to map this morphism to a function (a morphism in Set) that goes between C(a, x) and C(a, y). Let’s define this lifted function component-wise: given any element h from C(a, x) we can map it to f . h. It’s just a composition of two morphisms from C. The resulting morphism is a member of C(a, y). We have lifted a morphism f from C to Set thus establishing that C(a, _) is a functor. Now consider two such functors, C(a, _) and C(b, _). The Yoneda embedding theorem tells us that there is a one-to-one correspondence between the set of natural transformations between these two functors and the hom-set C(b, a). Notice the reversed order of a and b on the right-hand side. Let’s rephrase what we have just seen. For every a in C, we can define a functor C(a, _) from C to Set. Such a functor is a member of the functor category Fun(C, Set). So we have a mapping from C to the functor category Fun(C, Set). Is this mapping a functor? We have just seen that there is a mapping between morphisms in C and natural transformations in Fun(C, Set) — that’s the gist of the Yoneda embedding. But natural transformations are morphisms in the functor category. So we do have a functor from C to the functor category Fun(C, Set). It maps objects to objects and morphisms to morphisms. It’s a contravariant functor, because of the reversal of a and b. Moreover, it maps the hom-sets in the two categories one-to-one, so it’s a fully faithful functor, and therefore it defines an embedding of categories. Every category C can be embedded in the functor category Fun(C, Set). That’s called the Yoneda embedding. There’s an interesting consequence of the Yoneda embedding: Every functor category can be embedded in its own functor category — just replace C with a functor category in the Yoneda embedding. Recall that functors between any two categories form a category. It’s a category in which objects are functors and morphisms are natural transformations. Yoneda embedding works for that category too, which means that a functor category can be embedded in a category of functors from that functor category to Set. Let’s see what that means. 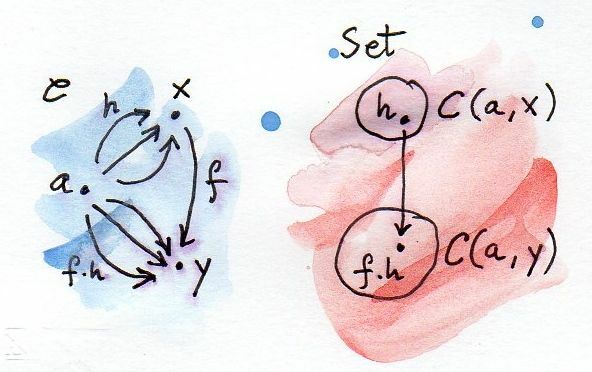 We can fix one functor, say R and consider the hom-set from R to some arbitrary functor f. Since we are in a functor category, this hom-set is a set of natural transformations between the two functors, Nat(R, f). Now let’s pick another functor S. It also defines a set of natural transformations Nat(S, f). We can keep picking functors and mapping them to sets (sets of natural transformations). In fact we know from the previous argument that this mapping is itself a functor. This time it’s a functor from a functor category to Set. All natural transformations in this formula are regular natural transformation except for the outer one, which is more interesting. You may recall that a natural transformation is a family of morphisms parameterized by objects. But in this case objects are functors, and morphisms are themselves natural transformations. So it’s a family of natural transformations parameterized by functors. Keep this in mind as we proceed. You can already see one element of the van Laarhoven representation: the quantification over a functor. The next step is to pick the appropriate functors for R and S. We’ll take R to be IStore a b and S to be IStore s t.
So, for any b, the functor-valued functor IStore _ b is left adjoint to Flapp b. This is what makes IStore special. As a side note: IStore a b is a covariant functor in a and a contravariant functor in b. However, Store a is not functorial in a, because a appears in both positive and negative position in its definition. So the adjunction trick doesn’t work for a simple (monomorphic) lens. We can now turn the tables and use the adjunction to define the functor IStore in an arbitrary category (notice that the Yoneda lemma worked only for Set-valued functors). We just define a functor-valued functor IStore to be the left adjoint to Flapp, provided it exists. 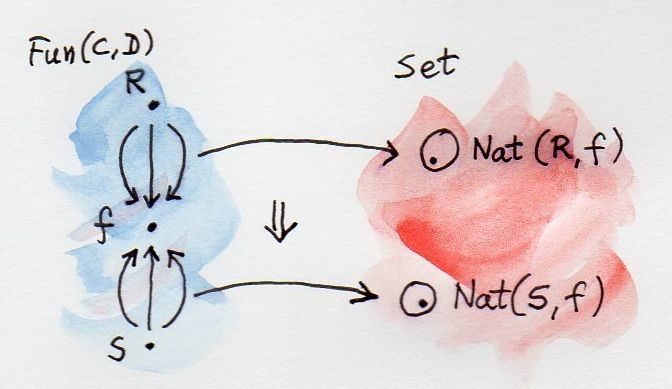 Here, Nat is a set of natural transformations between endofunctors in C.
This is slightly more general than the original van Laarhoven equivalence. We can go even farther and reproduce the Jaskelioff and O’Connor trick of constraining the generic functor in the definition of the van Laarhoven lens to a pointed or applicative functor. This results in a multi-focus lens. In particular, if we use pointed functors, we get lenses with zero or one targets, so called affine lenses. Restricting the functors further to applicative leads to lenses with any number of targets, or traversals. 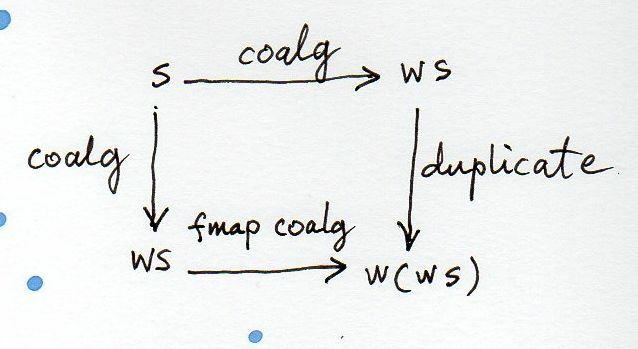 Here, U is the forgetful functor, and S* is the free applicative/pointed version of the functor S. The functor f ranges across applicative (respectively, pointed) functors. The formula holds for any applicative (pointed) functor f and a set of natural transformations over such functors. (the action of U is implicit). These are all known results, but the use of the Yoneda embedding and the adjunction to define the IStore functor makes the derivation more compact and slightly more general. I’m grateful to Mauro Jaskelioff, Gershom Bazerman, and Joseph Abrahamson for reading the draft and providing helpful comments and to André van Meulebrouck for editing help. Simon Peyton Jones, Lenses: Compositional Data Access and Manipulation. A Skills Matter video presentation. This is great. Can you enlighten how you get from functors into Set in Yoneda to any functor? (forall f. Functor f => …) Is there some known result about what’s good for Set, is good for any CCC? There is no general result like this. Some theorems explicitly mention Set — that would be the Yoneda lemma. But other things, like adjunctions, are valid for any category (well, locally small). Yoneda embedding deals with isomorphisms of hom-sets (or sets of natural transformations), which are sets. Even those can be generalized, though, if you decide to work with enriched categories. Haskell itself is a weird client of category theory, because at its core is based on typed lambda calculus, which is a model of CCC; but then it has to deal with non-strictness, which takes it outside of it. So if one can prove theorems that are not tied to Set than they will be valid outside of the strict subset of Haskell. At least that’s the general idea. You state this so confidently, even though anybody can define additional two-valued type in one second. Valentin: And guess what: They are all equivalent to Bool.